It's around that time of year again - Target is rolling around all of their school supplies, stores are having back to school clothing sales, and universities are beginning to send out dozens of emails to ready students for the coming year. August always takes me by surprise, because it seems like the second half of the month is solely dedicated to getting ready for the new school year. I remember how nervous I was in the August between my senior year of high school and freshman year of college, because the realization of leaving home and embarking on a whole new chapter of my life hit me hard. I spent the beginning and middle of the summer celebrating the fact that I was done with high school, but then it dawned on me that I would be leaving in a month to start a whole time in my life. The nerves hit hard and fast, and I honestly didn't know what to do with myself. It can be a very scary transition, because it's probably one that you've never experienced before. Just because it's new and scary, though, doesn't mean that it can't be exciting at the same time! It's important to try and work through the nerves and anxiety, and get excited to start university. Here's some tips on how to do just that! 1. Focus on buying things for your new space. Whether you're going to be living in on-campus dorms, in a sorority, or maybe even your own apartment, it's important to make sure you have everything for your new living space. Focusing on buying everything you'll need can also get you excited about moving in, so it's a win-win situation. You'll be less stressed about forgetting something, and you'll also be focusing your nervous energy into doing something productive. 2. Look at clubs on campus, or ways to get involved, before you move in. Knowing what kinds of clubs or groups you want to join can make the transition a lot easier, because you know for sure you'll have a way to meet people and make friends. That can be one of the scariest parts of going to college, the fear that you won't be able to make new friends or find people who you're comfortable with, so it really helps to have some places to check out to get to know people naturally! 3. Print out pictures to hang up in your room before you leave. One of my biggest concerns before I left college was if I was going to be super homesick or not. I had never really been away from home for that long before, just week long summer camps, so it was really scary to imagine being away for months at a time. I knew I would visit on some weekends, but it was still the first time that I wouldn't be living with my family. In order to remind myself of my family and friends, I printed out lots of pictures to hang up in my dorm room, and they were some of the first things to go up to make sure I didn't get too homesick! This honestly helped so much to calm my nerves, and I highly suggest doing it! 4. Memorize your class schedule, and where those classes are. I will be the first to admit that my sense of direction is completely terrible. I still get lost at the mall in my hometown, sadly, so the thought of trying to navigate a huge college campus was very daunting. My university actually has an app with a map similar to how Google Maps works, in that it finds your location so you can see how to get to certain buildings, in case you have absolutely no idea where you're going (this happened to me a lot freshman year). I made sure to download it before I left in September, and I looked at the where the buildings all of my classes were in so I would have some idea of where I was going. 5. Try to spend as much time with your friends as possible, especially if you'll be going to different schools. Since they're in the same boat as you, your friends can be great people to talk about your worries for the next year. They are probably just as nervous as you, so it can be beneficial to talk to each other, just to have some people to relate to! It can really help to realize you aren't alone, and that other people are in the same position as you. It's super easy to feel like you're the only person who is excited but still very worried to be going to college, since everyone seems like they can't wait to get out of their house and go. That is definitely not the case, though, and more often than not, if you talk with your friends about some of the things your nervous about, they'll tell you what their worried about. College is definitely something to be excited about, but it's hard to see that when you're struggling with anxiety about it. Just know that everyone else is in the same boat as you, and that you aren't the only one struggling with the nerves. Try and think about all of the fun you're going to have soon, and things will get a lot easier! Trust me that college really is so much better than high school, and that you will meet some really great people and have some amazing experiences. Are you getting excited for school? I am already going to my second year of my bachelor, but girl! Your advice is still good and accurat for me. I really like your blog. Looking forward to your next post. Thank you for the advice! 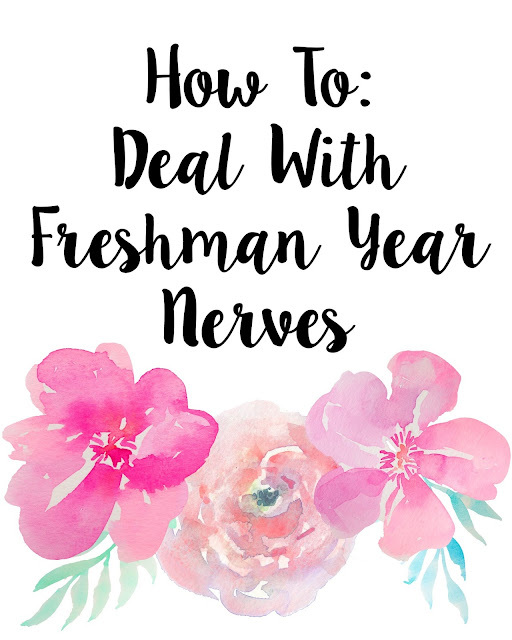 Every students entering a college or university wants to feel safe about studying and be prepared for it, have a peek at this weblink if you are looking for the tips for freshmen! I guess that is the usual problem for every student to feel homesick. And each of us finds our own way how to cope with it. I am glad that I have also found the way how to work on my college application essays and how make them excellent.